Turkey is a plethora of ancient cultures, fascinating landscapes and archaeological ruins that span 13 successive civilizations. It is a land whose known historical origins date back almost 10,000 years ago to one of the worlds earliest communities at Catalhoyuk and is acclaimed as the "Cradle of Civilization." Although not known as Turkey until recent times, the Koran, the Torah and the Bible refer plenteously to this ancient land. Muslims, Jews and Christians share a common heritage in Abraham, the Patriarch who lived in Haran almost four thousand years ago among the Hittites, an advanced civilization of Indo European speaking people who settled in Anatolia. Two thousand years after Abraham, St. Paul, the Apostle was born in Taurus, a city in southern Turkey and his work throughout Asia Minor is reflected in his letters to the Galatians and the Ephesians of Central and Western Anatolia. Roman rule gave way to the rise of Byzantium in Asia Minor and many churches and monasteries of this era remain. With the arrival of the Turks from Central Asia, Islam was established as the religion of the land. Mosques of great beauty, holy sites and shrines are located all over the country. In the 13th Century, the philosopher, poet and Sufi saint, Mevlana Celaleddin Rumi lived and taught in Konya. He is among the greatest of the mystical masters and his tomb in Konya is one of Islams most revered shrines. In the 15th century, there was an influx of Sephardic Jews from Spain. They were expelled by Queen Isabella and King Ferdinand for refusing to convert to Catholicism and were offered refuge by Sultan Bayazid II. However, Jews had already been resident in Turkey for many centuries. One of the oldest synagogues in Asia Minor is found in Sardis and dates back to 3 AD. 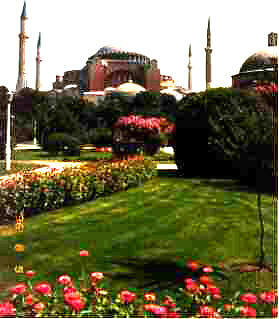 Perhaps the greatest symbol of Turkeys mixed culture is the Hagia Sophia museum in Istanbul. It was the most magnificent church in all of Byzantium. Minarets were added when it was converted to a mosque and the Star of David is imprinted on its beautiful chandelier. For thousands of years, the famed silk and spice routes passed from India and China to the west through Anatolia. Control of this land bridge was a lucrative business until the Portuguese explorer, Vasco da Gama, established a sea route to India around Africa. The decline of the Ottoman Empire coincided with the lessening importance of these ancient trading land routes. It is interesting to note that today, Turkey is uniquely positioned as yet another bridge: a link between the west and the former Soviet Republics of Central Asia. Already, Turkey is the main supplier of manufactured goods to these struggling republics and ancient trade routes to the Caspian are bustling anew. As the west continues to negotiate access to the tremendous oil reserves of the Caspian region, Turkey is sure to play a pivotal role. Once again, we may recall the legends of ancient Anatolia: The Lydian King Croesus is associated with great wealth and Phrygian King Midas turned everything he touched into gold.